Beginning with a quote from Sir Winston Churchill. Three things to do today: to explain, for those who may not know, something about the history, function and the roles of the World University Service of Canada; to describe why and how the University of Guelph is involved and actively participates in WUSC activities; and to relate some of the new opportunities that WUSC is providing to enhance global citizenship. The WUSC, making a difference in people's lives across the world, and how that is so. The WUSC as a key non-profit development agency in Canada. Funding from CIDA. Mandate and mission. The annual international seminar program. The connection between the University of Guelph and WUSC. Background of the University of Guelph. New opportunities for global citizenship presented by WUSC. Two initiatives to highlight: Students without Borders and Leave for Change. A brief explication of both. A request for support with advocacy. A reward for the audience's patience in listening. William D. Laidlaw, Executive Director, Canadian Biotechnology Education Resource Centre, and Past President, The Empire Club of Canada; Mark Macchia, Senior Student, Forest Hill Collegiate Institute; Rev. Canon Philip Hobson, Incumbent, St. Martin-in-the-Fields Anglican Church; Paul Davidson, Executive Director, World University Service of Canada (WUSC); Ratna Omidvar, Executive Director, The Maytree Foundation; Patrick Johnston, President and CEO, The Walter and Duncan Gordon Foundation; Ken Shaw, National Editor and Anchor, CTV News at Six, and Director, The Empire Club of Canada; H. Anthony Arrell, Chairman and CEO, Burgundy Asset Management Ltd., and Member of the Board of Trustees, University of Guelph; Karen Farbridge, Mayor, City of Guelph, Ontario; and George L. Cooke, President and CEO, The Dominion of Canada General Insurance Company, and Past President, The Empire Club of Canada. It was Edmund Burke who said, "The only thing that allows evil to flourish is that good people do nothing." The World University Service of Canada has, since its inception in 1939, been about Creating A World of Difference--by making a difference by doing something. WUSC is a network of people and post-secondary institutions whose mission is to foster human development and global understanding through education and training. WUSC is active on more than 70 campuses across Canada and in 17 countries overseas. WUSC has been engaging Canadians and improving lives for more than six decades. Health care, adequate food, HIV/AIDS, clean water and education are the challenges facing people in developing countries. They are so numerous and so pressing that it can seem difficult to pick just one to focus on. Difficult, yes--but not impossible. At WUSC, education has been intrinsic to their mission since their inception, and it still is. They believe education is one of the best ways to build a more equitable world for everyone, because it's the most effective way to prevent poverty and illness--and, by so doing, improve people's quality of life. Basic literacy is still lacking in almost 800 million adults around the world. Two-thirds of them are women, and more than 100 million are children living in sub-Saharan Africa as well as Asia. In response, WUSC and its partners are delivering a range of education projects as diverse as strengthening basic education for girls in Ghana, providing vocational training for youth in Sri Lanka, delivering more and better textbooks to schools in Malawi, and managing scholarships for students from the South studying at Canadian universities and colleges. Dr. Alastair J. S. Summerlee became the seventh president of the University of Guelph on July 15, 2003. President Summerlee, whose career as a scholar, professor, researcher and administrator spans nearly 30 years, joined the University of Guelph faculty in 1988 as a professor in the Department of Biomedical Sciences. He was named an associate dean of the Ontario Veterinary College in 1992, dean of graduate studies in 1995, associate vice-president (academic) in 1999, and provost and vice-president (academic) in 2000. He has continued teaching while holding administrative positions and was awarded a prestigious 3M Teaching Fellowship in June 2003 for outstanding leadership in teaching, education and academic program development. He is the only University of Guelph professor to earn the honour while serving as an administrator and is the first president-elect in Canada to be named a 3M Fellow. He was also recognized with a Distinguished Professorial Teaching Award from the University of Guelph Faculty Association in 1991. His research in biomedical sciences is acclaimed internationally and he has attracted significant money to support his research, published extensively and been an invited lecturer at universities and colleges around the world. He holds a BSc, BVSc and PhD from the University of Bristol in the United Kingdom and is a member of the Royal College of Veterinary Surgeons. In 2004 Dr. Summerlee received the Doctor of Laws (Honoris causa) from the University of Bristol. Dr. Summerlee is the President of the World University Service of Canada. Please greet with me Dr. Summerlee. Mr. President, Mr. Chancellor, honoured members of the high table, members and guests of the Empire Club of Canada, I am truly honoured to be invited to join the illustrious group of speakers who have graced the Empire Club. As it is the oldest and largest speakers' forum in Canada, I am humbled to stand before you to speak about my two favourite subjects: the World University Service of Canada (WUSC) and the University of Guelph. I would like to thank Mr. George Cooke, President and CEO of the Dominion of Canada General Insurance Company and Past President of the Empire Club, for hosting this luncheon. Finally, I would like to thank everyone for attending today: the significant group of people attending clearly indicates the strength of support for WUSC and the University of Guelph. I would like to begin with a quote from Sir Winston Churchill, a previous speaker at the Empire Club: "You make a living by what you get. You make a life by what you give." And it does not matter whether you subscribe to the view from the right of the political spectrum that "service is one of freedom's safeguards--it ensures caring is free from political control" or whether you believe in the maxim of the left that "we're all in this together," I think that we would all agree that being involved, improving the lives of others, is a critically important component of our society. I wish to do three things today: to explain, for those who may not know, something about the history, function and the roles of the World University Service of Canada; to describe why and how the University of Guelph is involved and actively participates in WUSC activities; and to relate some of the new opportunities that WUSC is providing to enhance global citizenship. The World University Service of Canada is making a difference in people's lives across the world and educating people at home and abroad about the challenges that face people in the developing world. Thanks to the work of WUSC more than one million people in Peru now have running water and sanitation in their homes and the daily income of many women in rural communities in Sri Lanka has improved. At the same time, through the actions of WUSC there have been significant improvements to civil society and governance processes in the Balkans. It is these three examples, and many others, that illustrate the way WUSC is creating sustainable development activities and projects in countries deeply scarred by some of the world's greatest problems: poverty, war and disease. And it is these three areas, which form the key focus for the activities of WUSC. As a key non-profit development agency in Canada, WUSC receives more than 40 per cent of its funding from the Canadian International Development Agency (CIDA) for which we are very grateful. We have long focused our development efforts in a limited number of countries to ensure that there is critical mass to create the appropriate level of change that can be sustained but we are active in a number of countries and geographic regions across the world in almost every continent. A considerable part of our mandate and mission is also devoted to education: education of people here in Canada to broaden the understanding of Canadians and to educate the people in developing countries about the challenges that they face and provide them with the tools to make a difference in their own lives. At home, there are more than 60 colleges and universities that belong to the consortium. On these campuses, the student chapters remain the cornerstone of WUSC. The chapters provide the focus to inform students about the challenges in the developing world and the anchor of many of the initiatives, which have made WUSC a unique non-profit development agency in Canada. One of the signature programs that WUSC provides is the Student Refugee Program. This remarkable program, which has been running for many years, seeks to place refugees from countries ravaged by war, poverty and disease in Canadian colleges and universities to complete some form of postsecondary education. There have now been more than 850 refugees brought to Canada in this way, which is a remarkable contribution as many not only settle and become outstanding members of Canadian society but also seek to work to improve the lives of others. But, perhaps what is more remarkable is that Canadian students host their refugee colleagues--not only do they provide the network and support for the refugee students, but also raise the funds to support the refugees. Each year, Canadian students raise more than a million dollars to support the Student Refugee Program in one way or another. Every year, for more than 50 years, WUSC has run an international seminar program: an annual study tour where students from Canadian universities visit a developing country and gain first-hand experience of the challenges. For many, the international seminar is the first and formative exposure to the developing world and the experience has a profound impact on the lives of its participants. We count three former prime ministers of Canada, eleven past and present members of Parliament and senators, two sitting members of the Supreme Court of Canada and many, many CEOs and eminent members of Canadian society among the alumni from this program alone. This year, the seminar will be held in Burkina Faso. So where is the connection between the University of Guelph in Ontario and WUSC? Perhaps to understand the path that has brought these two institutions together, it is necessary to understand a little of the background of the University of Guelph. Founded from three original colleges in the latter part of the nineteenth century, the University of Guelph was not officially incorporated as a university until 1964 but our alumni, our traditions and our values are deeply rooted in the activities of those founding colleges: agriculture, veterinary science and domestic science. From those days when the total number of registrants in the founding colleges was relatively small and the institution was located in a charming rural setting in the City of Guelph--a very considerable distance away from the City of Toronto--the University of Guelph has blossomed into the institution that it is today. Although the main campus still exists in the City of Guelph, we now have five campuses and 14 research stations spread across the province of Ontario. In fact, it takes 29 hours to drive from one end of the University of Guelph to the other--perhaps making us the largest-geographically-spread university in the Americas. In these five campuses we deliver a comprehensive range of programs and degrees to more than 20,000 diploma, undergraduate and graduate students. Emanating from the caring attitude of the pioneering spirit--sometimes jokingly referred to as the fields, the barns and the kitchen ethos--the University of Guelph has developed a formidable reputation for its concern about education and students. In fact, we have consistently been ranked as the number-one comprehensive and mid-size university in the country in terms of spirit and caring and for the quality of our academic programs. The university also offers a remarkable program for distance learners. Last year, there were over 51,000 enrolments in our distance education programs. At the same time, the University of Guelph is also research intensive--we are the number-one comprehensive university in research. This past year, we brought in more than $145 million in research monies and published more papers, scientific reports and commentaries than other institutions in the comprehensive category. Again, there is a special sense of connection between the research and the ways in which we live our lives. Many of the areas of research at Guelph are nuanced by the real, practical challenges that we face in the world. In fact, we are building the largest biological-life science facility in Canada to help deal with some of these challenges--the environment, emerging diseases, and energy sources and efficient uses. So the University of Guelph is clearly pre-eminent in teaching and research in ways that link with the aspirations and concerns of WUSC, but there is one other critical way in which the university and WUSC are linked. In a country where Statistics Canada reports that about 40 per cent of the population engages in meaningful volunteer activities, 70 per cent of students at Guelph volunteer in our community--a community that spans the world. We have students engaged in working with the homeless in Guelph, Toronto and Calgary, working with HIV/AIDS education in Guelph and sub-Saharan Africa, collecting for food banks in Guelph, building homes in Latin America, and rebuilding lives in Katrina-torn parts of the United States or in areas devastated by the tsunami. It is this spirit of caring about the peoples around us that brings the University of Guelph close to WUSC: together we represent a formidable combination. To provide an example of the level of activity in simply fund-raising at Guelph, we raised more than $500,000 towards various charitable causes in the fall of 2006 including the United Way, the Masai Project, Meal Exchange and the Guelph Food Bank. Let me turn to the new opportunities for global citizenship presented by WUSC. There are two initiatives, which I would like to highlight: the Students Without Borders program and a program known as Leave for Change. The former provides opportunities for students to engage in in-depth learning experiences in developing worlds that can be used for credit in their home institution or for co-op experience. Work placements are organized and arranged in a number of different countries around the world--usually linked to development work being carried out by WUSC workers. Participants become truly immersed in the culture and society in which they work. They develop a real and deep appreciation for the peoples and the problems that they face. The program was first established a year ago and is remarkably popular among students. The challenge for the program is finding sponsors who support the students on these sojourns. Leave for Change is a new venture in English-speaking Canada. In 2005, WUSC joined forces with its French counterpart CECI (Centre ƒtude et de Coopération Internationale) to form a collaborative partnership to support and enhance opportunities for volunteerism. This partnership created an organization, Uniterra, an international program that mobilizes partners, volunteers and the Canadian public to contribute to the Millennium Development Goal of reducing world poverty by 50 per cent by 2015. Once again, I need to acknowledge the fundamental role that CIDA has played in providing financial support for this very important initiative and for its programs. Uniterra fosters partnerships between organizations and networks in Canada and elsewhere to educate at home and abroad, to advocate at home and to volunteer abroad. The Leave for Change program promotes short-term volunteer opportunities in international settings where specific or non-specific skills are needed to complete or work on a meaningful and helpful project. Private and public sectors are asked to participate by making a financial contribution to the project and employees offer to volunteer their holiday time to work abroad. The University of Guelph will be the first university and institution in English-speaking Canada to participate in this program this year and I hope that other universities, publicly funded institutions, municipalities and private companies will wish to follow suit. There are many people in our society who want to make a difference and would be willing to use some of their holiday time to work for others in need. The experiences gained and the values learned are invaluable both abroad and at home. Uniterra now has volunteer opportunities in 13 countries around the world and the list of opportunities is growing. So the important question, which I am sure is on everyone's minds, is what can I do to help? Let me say that many people and institutions do make significant financial contributions to development agencies such as WUSC. We are particularly grateful for the support of our programs and there are a number of people here today who have supported WUSC programs, but financial support for two key programs--the Student Refugee Program and the new Students Without Borders Program--would be especially welcome. WUSC also needs your support with advocacy: advocacy to support government programming such as CIDA which is a vital arm of the roles that Canada plays on the international stage and in support of persuading our governments to be more proactive in committing to the Millennium Development Goals. Finally, I would like to encourage you to think about participating in the Leave for Change program, either personally or through your company/institution. Think what a difference it could make to you, the people you work with and the people you would work for on the volunteer experience! And I do have a reward for your patience in listening to me, today. I can invite you to Guelph to attend the Shakespeare-Made in Canada festival, which will run from January to May 2007. Centred on an exhibition at the Macdonald Stewart Art Centre at Guelph, where the Sanders portrait of Shakespeare will be on display, there is a festival of cultural events clustered around Guelph and Stratford over the next five months. The Sanders portrait, which is owned by Lloyd Sullivan, a native of Kemptville Ontario, is the only picture said to have been painted of William Shakespeare in his lifetime and has been subject to all the forensic tests possible to substantiate that claim. 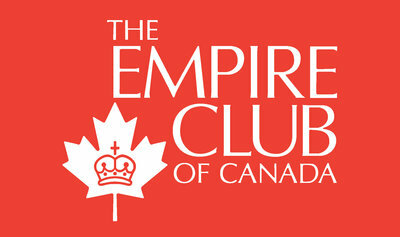 Thank you for giving me the opportunity to speak at the Empire Club today and for listening to me. It is a pleasure and an honour to serve both the University of Guelph and WUSC, two formidable institutions that I have the privilege of serving. The appreciation of the meeting was expressed by George L. Cooke, President and CEO, The Dominion of Canada General Insurance Company, and Past President, The Empire Club of Canada.